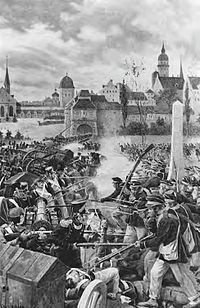 The Battle of Leipzig or Battle of the Nations (German: Völkerschlacht) was fought by the coalition armies of Russia, Prussia, Austria and Sweden against the French army of Napoleon I, Emperor of the French, at Leipzig, Saxony. Napoleon's army also contained Polish and Italian troops as well as Germans from the Confederation of the Rhine. The battle marked the culmination of the autumn campaign of 1813 during the German campaign and involved over 600,000 soldiers, making it the largest battle in Europe prior to World War I. Being decisively defeated for the first time in battle, Napoleon was compelled to return to France while the Allies hurried to keep their momentum, invading France early the next year. Napoleon was forced to abdicate, and was exiled to Elba that spring. Following Napoleon's failed invasion of Russia and the defeat of his forces in the Peninsular War, the anti-French forces had cautiously regrouped as the Sixth Coalition, comprising Russia, Austria, Prussia, Sweden, Britain, Spain, Portugal and certain smaller German states. In total, the Coalition could put into the field well over a million troops; indeed by the time of Leipzig, total Allied armies east of the Rhine probably exceeded a million. By contrast Napoleon's forces had shrunk to just a few hundred thousand. Napoleon sought to re-establish his hold in Germany, winning two hard-fought tactical victories, at Lützen on 2 May and Bautzen on 20–21 May, over Russo-Prussian forces. The victories led to a brief armistice. He then won a major victory at the Battle of Dresden on 27 August. Following this, the Coalition forces, under individual command of Gebhard von Blücher, Crown Prince Carl Johan of Sweden and Karl von Schwarzenberg, and Count Benningsen of Russia followed the strategy outlined in the Trachenberg Plan to avoid clashes with Napoleon but to seek confrontations with his marshals, which led to victories at Großbeeren, Kulm, Katzbach and at Dennewitz. Marshal Nicolas Oudinot was defeated at the Battle of Großbeeren and thus failed to capture Berlin with his army of 60,000. This forced Napoleon to withdraw westwards because of the threat to the north, crossing the Elbe in late September and organising his forces around Leipzig to protect his supply lines and meet the Allies. Napoleon deployed his army around the city, but concentrated his force from Taucha through Stötteritz, where he placed his command. The Prussians advanced from Wartenburg, the Austrians and Russians from Dresden and the Swedish force from the north. The French had around 160,000 soldiers along with 700 guns plus 15,000 Poles, 10,000 Italians, and 40,000 Germans belonging to the Confederation of the Rhine, totaling to 225,000 troops on the Napoleonic side. The coalition had some 380,000 troops along with 1,500 guns, consisting of 145,000 Russians, 110,000 Austrians and Hungarians, 90,000 Prussians, and 30,000 Swedes. This makes Leipzig the largest battle of the Napoleonic wars, surpassing Borodino, Wagram, Jena and Auerstadt, and Ulm. The French Grande Armée, under the supreme command of Emperor Napoleon, was in a weakened state; most of his troops consisted of teens and inexperienced men conscripted shortly after the utter destruction of Grande Armée during Napoleon's ill-fated invasion of Russia. Napoleon conscripted these men to be readied for an even larger campaign against the newly formed Sixth Coalition and its forces stationed in Germany. Whilst he won the battles at Lützen and Bautzen, his army was steadily depleting as Grande Armée forces were seemingly defeated in some battles commanded by Napoleon's marshals while the commanders of the Coalition forces closely followed the Trachenberg Plan. The French Imperial cavalry was also depleted; they were of poor quality compared to those who were mobilized during the Russian campaign. This was the reason why Napoleon could not keep his eyes on his lines of communications or scout some enemy positions, the fact that influenced the outcome of the battle at Grossbeeren, a settlement just south of Berlin, and also at many battles that developed during Napoleon's campaign in Germany. The Coalition army was composed of four army-level commands: the Austrian Army of Bohemia under Karl von Schwarzenberg, the Prussian Army of Silesia under Gebhard von Blücher, the Russian Army of Poland under Levin August von Benningsen and the Swedish Army of the North under Charles John Bernadotte. The Swedes also had a contingent of British Congreve rocket artillery auxiliaries from the Royal Horse Artillery. Despite being outnumbered, Napoleon planned to take the offensive between the Pleisse and the Parthe rivers. The position at Leipzig offered several advantages for a resourceful commander. The rivers that converged there split the surrounding terrain into many separate sectors. 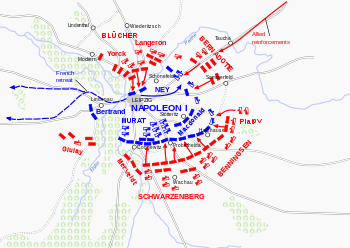 Holding Leipzig and its bridges, Napoleon could shift troops from one sector to another far more rapidly than could the Allies, who had difficulty commanding such a large number of troops in a single sector of fighting. The northern front was defended by marshals Ney and Marmont, and the eastern front by MacDonald. Artillery reserve and parks, ambulances and baggages stood near Leipzig. The bridges on Pleisse and Elster River were defended by infantry and few guns. The main battery stood in reserve, and during battle was to be be deployed on the Gallows Height. This battery was to be commanded by Drouot himself. The western flank of French positions at Wachau and Liebertwolkwitz was defended by Poniatowski and Augereau and his French young conscripts. A substantial staff supported the allied commanders, but their staff was not a smooth running and efficient organization. It was fraught with incompetence and petty rivalries where factions fought each other; its work was as much military as it was toadying to the vanities of the monarchs. At first, many considered Schwarzenberg as the one fit to be the overall supreme commander for the Coalition forces in the battle, but because Alexander I, the Emperor of Russia, complained about his incompetence in terms of battle planning (Schwarzenberg's main plan was to call for a secondary attack on the bridge between Leipzig and Lindenau to be led by Blucher and Gyulay, and a main attack astride the Pleisse River to be led by Merveldt, Hessen-Homburg and the Prussian Guard) compared to marshals Prince Volkonsky of Russia, Johan Christopher Toll of Sweden, and Karl Friedrich von dem Knesebeck and Gerhard von Scharnhorst of Prussia, as did most of the command staff, but he had Schwarzenberg draft another battle plan. Schwarzenberg then drafted the said plan that was largely designed to let everyone do as they pleased. The plan was as follows: Blucher's axis of advance was to be shifted northward to the Halle road, the Russian and Prussian guards and the Russian heavy cavalry was to be amassed at Rotha in general reserve. The Austrian grenadiers and cuirassiers would advance between the rivers. This strategy would ensure the encirclement of the French army in Leipzig and its vicinity. The allied offensives achieved little and were soon forced back, but Napoleon's outnumbered forces were unable to break the allied lines, resulting in a hard fought stalemate. The Austrian II Corps, commanded by General von Merveldt, advanced towards Connewitz via Gautzsch and attempted to attack the position by the time Napoleon arrived in the battlefield along with the Young Guard and some Chasseurs, or the Imperial snipers, only to find that the avenue of advance was well covered by French battery and some skirmishers who have occupied the houses there and did not permit the Austrians to deploy their artillery in support of the attack. Merveldt himself turned unfortunate as he was wounded and captured by the French after he went straight into the Saxon-Polish lines in the Pleisse River, thinking that they were Prussian musketeers and Hungarian grenadiers retreating from the vicious defense of the enemy lines. Repulsed, the Austrians then moved to attack nearby Dölitz, down a road crossed by two bridges and leading to a manor house and a mill. Two companies of the 24th Regiment threw out the small Polish garrison and took the position. A prompt counterattack by the Saxons and Poles ejected the Austrian troops and the battle seesawed, until the Austrians brought up a strong artillery battery and blew the Poles out of the position. The Poles left bodies everywhere in their furious defense and set fire to both the manor and the mill on the way out. General Kleist, moving along the Pleisse River, attacked Marshals Poniatowski and Augereau in the village of Markkleeberg. The Austrians repaired a bridge and took a school building and manor. The French counterattacked, throwing the Austrians out of the school and back over the river. French attacks on the manor only resulted in mounting casualties for the French and Poles. The Russian 14th Division began a series of flanking attacks that forced the Poles out of Markkleeberg. Marshal Poniatowski stopped the retreat and the advancing Russians. Catching four battalions of the Prussian 12th Brigade in the open, Poniatowski directed attacks by artillery and cavalry until they were relieved by Russian hussars. Marshal Poniatowski retook Markkleeberg, but was thrown out by two Prussian battalions. Austrian grenadiers then formed in front of Markkleeberg and drove the Poles and French out of the area with a flank attack. The Russian II Infantry Corps attacked Wachau near Leipzig with support from the Prussian 9th Brigade. The Russians advanced, unaware that French forces were waiting. The French took them by surprise in the flank, mauling them. The Prussians entered Wachau, engaging in street to street fighting. French artillery blasted the Prussians out of Wachau and the French recovered the village. Liebertwolkwitz was a large village in a commanding position, defended by Marshal MacDonald and General Lauriston with about 18,000 men. Johann von Klenau's Austrian IV Corps attacked with 24,500 backed up by Pirth's 10th Brigade (4,550) and Ziethen's 11th Brigade (5,365). The Austrians attacked first, driving the French out of Liebertwolkwitz after hard fighting, only to be driven out in turn by a French counterattack. At this point, Napoleon directed General Drouot to form a grand battery on Gallows hill. This was done with 100 guns that blasted the exposed Russian II corps, forcing the Prussian battalions supporting it to take cover. Russian General Württemberg was notable for his extreme bravery, directing his troops under fire. The hole had been now opened as Napoleon wished and at this point, Marshal Murat was unleashed with 10,000 French, Italian, and Saxon cavalry. However, Murat's choice of massive columns for the attack formation was unfortunate for the French force, as smaller mobile formations of Russian, Prussian, and Austrian cavalry were able to successfully harass Murat's Division, driving them back to their own artillery, where they were saved by the French Guard Dragoons. The young Guard Division was sent in to drive out the allies and give Napoleon his breakthrough. They recaptured both Liebertwolkwitz and Wachau, but the Allies countered with Russian Guard and Austrian grenadiers backed by Russian cuirassiers. The units lived up to their elite reputation, forming squares that blasted French cavalrymen from their horses and overran the French artillery batteries. On the southern front, although Napoleon gained ground, he could not break the Allied lines. The northern front opened with the attack by General Langeron's Russian Corps on the villages of Groß-Wiederitzsch and Klein-Wiederitzsch in the center of the French northern lines. This position was defended by General Dabrowski's Polish division of four infantry battalions and two cavalry battalions. At first sign of the attack, the Polish division attacked. The battle wavered back and forth with attacks and counterattacks. General Langeron rallied his forces and finally took both villages with heavy casualties. French infantry defend a barricade against a Prussian assault. The overwhelming result of the battle forced Napoleon to abandon his control over Germany. The Northern front was dominated by the battle of Möckern. This was a 4 phase battle and saw hard fighting from both sides. A manor, palace, walled gardens, and low walls dominated the village. Each position was turned into a fortress with the walls being loopholed for covered fire by the French. The ground to the west of the position was too wooded and swampy for emplacement of artillery. A dike ran east along the river Elster being 4 meters high. Marshal Auguste Marmont brought up infantry columns behind the positions in reserve and for quick counter-attack against any fallen position. Blücher commanded Langeron's (Russian) and Yorck's (Prussian) corps against Marmont's VI Corps. When the battle hung in the balance, Marmont ordered a cavalry charge, but his commander refused to attack. Later, an attack by Prussian hussars caused serious loss to the French defenders. The battle lasted well into the night. Artillery caused the majority of the 9,000 Allied and 7,000 French casualties, and the French lost another 2,000 prisoners. There were only two actions on 17 October: an attack by the Russian General Sacken on General Dabrowski's Polish Division at the village of Gohlis. In the end, the numbers and determination of the Russians prevailed and the Poles retired to Pfaffendorf. Blücher, who was made a field marshal the day before, ordered General Lanskoi's Russian 2nd Hussar Division to attack General Arrighi's III Cavalry corps. As they had the day before the Sixth Coalition's cavalry proved to be superior, driving the French away with great losses. The French received only 14,000 troops as reinforcements. On the other hand, the coalition was strengthened by the arrival of 145,000 troops divided into two armies, one commanded by Russian General von Bennigsen from the Army of Bohemia's first line and the other, the Army of the North which consisted mainly of Swedish troops, commanded by Prince Charles John of Sweden. The Swedish prince was the ex-French Marshal Jean Baptiste Jules Bernadotte. He had been one of Napoleon's most trusted field marshals, but Napoleon had stripped him of command in 1810, which lead to his defection to the Coalition cause. It was evident that the Allies would encircle Napoleon and his army, and he knew that not retreating from the battle would mean capitulation for his entire army. So Napoleon began to examine whether the roads and bridges of Lindenau could be used to withdraw his troops, or at the very least to secure a bridgehead crossing on the Pleisse River. However, he was not yet in the mood for withdrawing as he thought that this day was the day he would achieve one more great victory for France. He also thought that a strong, formidable rear guard in Leipzig itself could repulse any Allied assault, which could buy him and his forces more time to withdraw from the battle. During this time Napoleon sent General von Merveldt, who had been captured two days earlier, back to the Allies on parole. Merveldt was given a letter to the Czar Alexander I, Prussian King Frederick William III, and Austrian Emperor Francis I in which Napoleon offered to surrender to the Coalition the fortresses he held along the Oder and Vistula, on the condition that the allies allow him to withdraw to a position behind the Saale. He added that, if approved, they should sign an armistice and undertake peace negotiations. However, all the monarchs declined the offer. The Coalition launched a huge assault from all sides. In over nine hours of fighting, in which both sides suffered heavy casualties, only the resilience and bravery of the French troops prevented a breakthrough, but were slowly forced back towards Leipzig. The Sixth Coalition had Field Marshal Blücher (Prussian) and Prince Charles John of Sweden to the north, the Generals Barclay De Tolly, Bennigsen (both Russian) and Prince von Hessen-Homburg (Austrian) to the south, and Ignác Gyulay (Austrian) to the west. The Prussian 9th brigade occupied the abandoned village of Wachau while the Austrians, with General Bianchi's Hungarians, threw the French out of Lößnig. The Austrians proceeded to give a demonstration of combined arms cooperation as Austrian cavalry attacked French infantry to give Austrian infantry time to arrive and deploy in the attack on Dölitz. The Young Guard Division threw them out. At this point, three Austrian grenadier battalions began to contest for the village with artillery support. In the meantime, at the behest of his Swedish officers, who felt embarrassed that they had not participated in the battle, the Crown Prince Charles John gave the order for his light infantry to participate in the final assault on Leipzig itself. The Swedish jägers performed very well, losing only about 121 men in the attack. The bloodiest fighting of the battle occurred in Probstheida, a village just southeast of Leipzig. Here, about 60,000 soldiers under Barclay de Tolly were marching and advancing towards the village in two columns, one Prussian under von Kleist advancing through Wachau, and one Russian under Wittgenstein advancing through Liebertwolkwitz. Barclay was pressured by the monarchs, especially the Russian tsar, to take the village since it was the key to Napoleon troops' positions, and although von Kleist opposed this, the monarchs' orders were paramount, so Barclay had to follow their orders anyway. The French dispositions at the village, however, were heavily fortified, thanks to the high and thick garden walls that gave excellent protection for the French infantry. The defense was also strengthened with artillery and strong infantry reserves behind the village. A day earlier the Russians had taken most of the losses incurred during the battle, so it was the Prussians who took the initiative. The Prussian jägers attempted to enter the village by storm but were quickly driven back. Then the artillery of both sides opened fire upon the village; despite the enormous numbers of amount of artillery the Coalition had brought with them, the more powerful French Imperial Guard Artillery gradually gained the upper hand. The Prussians conducted a series of waves of attacks against the French positions at the village, but with the French artillery repulsed the attack, their efforts in vain. The French cuirassiers, under Murat, charged upon the weakened Prussian lines and drove them back. Counter-charges by the numerous Russian cavalry saved the infantry by repeatedly driving back the French cavalry, albeit with heavy losses. The Prussians again conducted a charge upon French lines, but were less successful than the first one. The third assault was now conducted, this time, by the Russians, commanded by Raevsky, the hero of Borodino who arrived from his homeland due to sickness a few days earlier. The assault in the village was somewhat more successful than the first two, taking the gardens and killing several French infantry units, only to be driven back by the French Imperial Guard who just recently arrived at the scene. Despite von Schwarzenberg requesting the Russian tsar to send the Russian Guard, the latter ordered that more assaults were to be undertaken against the village. However, despite their successful, stubborn defense, the French were now in dire straits as they were dangerously short of manpower, and thus the fighting became only a hollow tactical victory for Napoleon. During the morning of the day, Sweden's Bernadotte and Prussia's Blucher held a conference in Breitenfeld. It was agreed that Bernadotte's Army of the North would pass the Parthe River at Taucha with a reinforcement of 30,000 men drawn from Blucher's Army of Silesia. Blucher agreed to dispatch Langeron's army corps, and to renounce his rank and his rights as army commander, putting himself at the head of his Prussians. 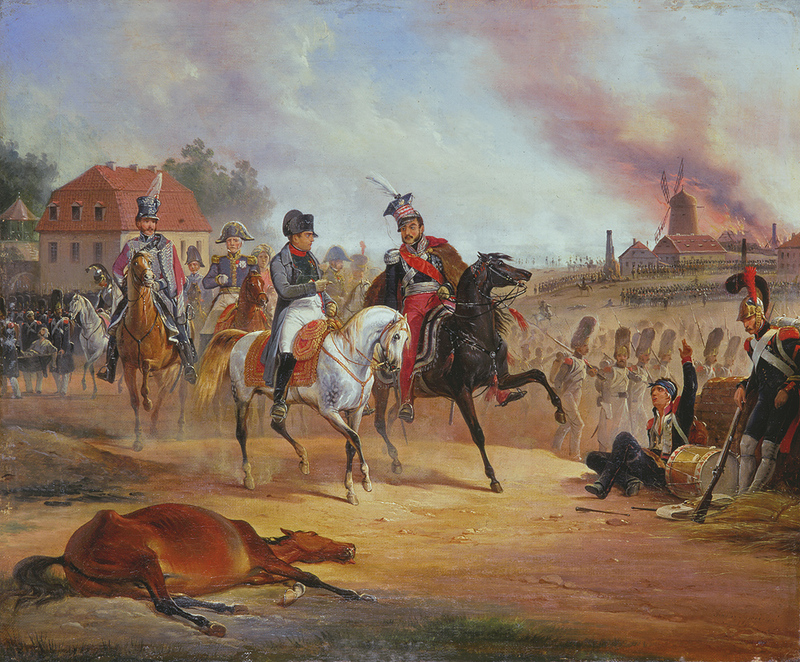 The advance of the Swedish army towards Leipzig had been slow, purportedly because Bernadotte had received word that Napoleon planned a renewed attack towards Berlin after his marshals' failure to take the city in the battles of Grossbeeren and Dennewitz. Platov's Russian heavy artillery began to fire upon the Saxons around Paunsdorf. Langeron placed pontoon bridges over the Parthe River and a flying bridge via Mockau; large masses of troops had now moved to the east bank of the river. Meanwhile, Russian and Austrian forces began attacking French and Saxon positions in Paunsdorf, but after counterattacks by French infantry and deadly canister shots from Franco-Saxon batteries are driven back. After being driven back, the Coalition troops were pursued by French infantry before being counterattacked by Austrian hussar and Grenzer cavalries, driving the French back. The fighting around Paunsdorf seesawed for the meantime. Then as the Prussian infantry under General Friedrich Wilhelm Freiherr von Bülow arrived in Paunsdorf, the Russian heavy artillery, Prussian horse cannons and the Swedish Congreve rockets began firing on Paunsdorf. Prussian and Austrian troops now took the village by storm and forced the French back to Sellerhausen. Two Prussian battalions and Swedish Congreve rockets pursued the French; the French rallied, however, and killed the commander of British rockets, Second Lieutenant Richard Bogue, and drove the Prussians back. More heavy fighting also occurred in Schonefeld. Coalition troops repeatedly commenced assaults on French dispositions there, but were forced back. But the French infantry attacking Coalition positions were also forced back. Repeated assaults by Russian musketeers and grenadiers under General Langeron drove the French out of Schonefeld. With the village falling to the Allies, the village of Paunsdorf also fell. The heavy fighting in Paunsdorf and Schonefeld eventually set these villages in fire. During the fighting, 5,400 Saxons of Jean Reynier's VII Corps defected to the Coalition. At first French officers saw the Saxons' rushing towards the advancing Prussians as a charge, but treachery became evident as they saw the Saxons asking the Prussians to join with them for the impending assault. Reynier himself witnessed this, and he rallied the remaining Saxons at his disposal, but to no avail, because Württemberg's cavalry also deserted from the French; this forced the French line in Paunsdorf to fall back. By the fourth day of the battle, Napoleon was treating the fighting as a lost cause. He had already begun withdrawing the majority of his army across the river Elster throughout the night of 18–19 October. But before this, he promoted Poniatowski to the rank of Maréchal d'Empire or Imperial Marshal, the only foreigner of all his marshals who was given this title, and the latter swore that he would fight to the last stand, which he did. The Allies only learned of the French evacuation at 7:00 on the morning of the 19 October. But they were held up in Leipzig because of a ferocious street-to-street rearguard action fought by Oudinot's troops. As the Russians and Prussians entered the city through the Grimma Gate they fell upon barricades and houses full of French soldiers. Civilians were forced into hiding as the bloody urban combat raged through the city. Napoleon's retreat continued smoothly until early afternoon when the general tasked with destroying the only bridge over the Elster delegated the task to a Colonel Montfort. The colonel in turn passed this responsibility to a corporal, who was unaware of the carefully planned time schedule. The NCO ignited the fuses at 1:00 in the afternoon while the bridge was still crowded with retreating French troops and Oudinot's rearguard was still in Leipzig. The explosion and subsequent panic caused a rout that resulted in the deaths of thousands of French troops and the capture of thousands of others. Marshal Poniatowski was one of the many who drowned while attempting to cross the river. The battle of Leipzig is the bloodiest in the history of Napoleonic Wars as casualties on both sides were astoundingly high; estimates range from 80,000 to 110,000 total killed, wounded or missing. Napoleon lost about 45,000 killed and wounded. The Allies captured 15,000 able-bodied Frenchmen, 21,000 wounded or sick, 325 cannon and 28 eagles, standards or colours, and had received the men of the deserting Saxony divisions. Among the dead was Marshal Józef Antoni Poniatowski, a nephew to the last king of Poland, Stanisław August Poniatowski. The Pole, who had received his marshal's baton just the previous day, was commanding the rear guard during the French retreat and drowned as he attempted to cross the river. Corps commanders Lauriston and Reynier were captured. Fifteen French generals were killed and 51 wounded. Out of a total force of 380,000, the Allies suffered approximately 54,000 casualties. Schwarzenberg's Bohemian Army lost 34,000, Blücher's Silesian Army lost 12,000, while Bernadotte's Army of the North and Bennigsen's Army of Poland lost about 4,000 each. The number of casualties the Coalition army suffered made it impossible for them to pursue the retreating Grande Armee, but the French themselves were already exhausted after the battle, and they hurried back to France to begin their hard-fought defense until the early spring of 1814. The Russian army enters Paris in 1814. The battle ended the First French Empire's presence east of the Rhine and brought the German states over to the Coalition. It also dealt a harsh blow against Napoleon himself, who was decisively defeated in battle for the first time in the Napoleonic Wars. He and his army were already fleeing ahead with his army back to France to muster its defense against the now-invading Coalition forces. With the battle ended with the Coalition nations as the victors, the German Campaign ended in a complete failure for the French, although they achieved a minor victory when an army of Kingdom of Bavaria attempted to block the retreat of the Grande Armée at Hanau. French forces did not enter Germany again until World War I. With the Kingdom of Italy now abolished and German states of the Confederation of the Rhine defecting to the Coalition cause, the Coalition pressed its advantage and invaded France in early 1814. Napoleon was forced from the throne of France and exiled to the island of Elba, and the First French Empire capitulated for the first time. Völkerschlachtdenkmal: Memorial to the Battle of the Nations, Leipzig, completed in 1913. In addition to the 91-metre-high Monument to the Battle of the Nations (Völkerschlachtdenkmal), the course of the battle in the city of Leipzig is marked by numerous monuments and the 50 Apel Stones that mark important lines of the French and Allied troops. ↑ The German name ("Battle of the Peoples") is much more appropriate than the English, as most of the participating countries were not yet nation states at the time. ↑ 7.0 7.1 (Esposito & Elting - "Military History and Atlas of the Napoleonic wars." ↑ William Cathcart (first edition 1850) Commentaries on the War in Russia and Germany in 1812 and 1813, London: J. Murray. Reissue: Demi-Solde Press, ISBN 1-891717-14-6. ↑ Smith, Digby George. 1813: Leipzig : Napoleon and the Battle of the Nations. Smith, Digby (1998). "The Napoleonic Wars Data Book". Greenhill. Wikisource has the text of the 1879 American Cyclopædia article Leipsic.